Phone Bills….how do you save? 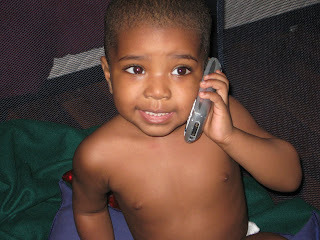 There he is….my little angel…talking to his grandma on one of our best money savers, the cell phone. DH and I each have a cell phone and we decided to use them as our house phone as well because is saves us about 100 dollars a month. We tried to have a “home phone” and even saved a little by not buying a new phone and using my old college one but it still was so unnecessary. My mother had a heart attack when we disconnected the house phone stating “what if the cell lines are down or something happens to the towers? You won’t be able to contact anyone!” *sigh* Yes, ladies and gentleman, she is the dramatic, doom is coming, mother type and i’ve endured her for almost 26 years. Thats my Mom! Anyways, if the towers were down, all lines….including her coveted house phone line, would be down as well. Those lovely phone companies have put all of their lines through those towers and guess what? Everything is computerized now as well, so just imagine if they all went down too? Has anyone ever seen the Terminator trilogies? Lol, so we save money by having the cell phone. I think its great, DH thinks its great, and obviously sonny boy and his little hands thinks it great as well. Plus, there’s voicemail AND caller ID on my phone, which means when Mom calls, I can pretend “my stupid cell phone doesn’t work” and she can leave a message. Don’t give me that look….I always call her back, eventually. « Remember to share your frugal goals with family!